I'm not much into musicals, but I just saw Wicked about 3 weeks ago and I have to tell you, it was AWESOME. That makes two musicals in my entire life. The other musical I saw was Ragtime in 11th grade. 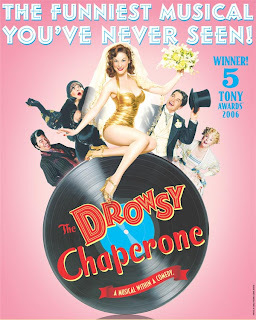 Right now, a presale is going on for tickets to "The Drowsy Chaperone" which will be playing in Boston from 4/22/08-5/4/08. Two weeks only, so if you're interested, here's your chance to get the good seats now. No presale password this time, just a secret link. You'll need to register with the website in order to qualify for the presale. Where's the secret link you ask? Right (here). A totally original new musical within a comedy. The most 2006 Tony Awards of any musical on Broadway, and the New York Drama Critics Circle and Drama Desk Awards for Best Musical! A rare combination of unprecedented originality and blinding talent, THE DROWSY CHAPERONE boldly addresses a great unspoken desire in all of our hearts: to be entertained. If You've ever sat in a darkened theatre and thought, "Dear Lord in heaven, please let it be good," this is the show for you. 0 Response to "Drowsy Chaperone Presale Tix"